I’m sure by now you have all heard of the Instagram user Creepytings. Its owner, a woman by the name of Casey Nocket, apparently went on a road trip through Western National Parks and – unfortunately – appears to have left a long trail of graffiti in her wake. We here at Modern Hiker broke the story first and we’ve since become ground zero for a lot of the discussion around this issue (the traffic slammed our otherwise excellent servers twice and will probably end up costing me some overage fees, but whatever). Early on, this was a rare example of the Collective Power of the Internet being used for Good. 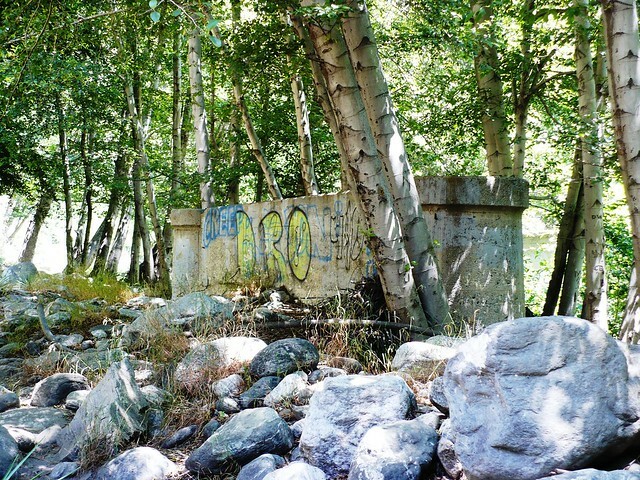 Both in our comments and on Reddit, users scanned the Instagram images we saved and were able to determine – in some cases down to the exact spots on the trail – the locations of most of the graffiti images. And based on the rich social media history, we were able to determine a long list of other National Parks that might also be affected by graffiti even though no images were posted (hence the National Park Service naming ten Parks in their press release). Now that the story is starting to reach beyond the outdoor world, I’ve noticed we’re running into some people who just don’t seem to be able to see what the big deal is. I hope this post can answer some of their questions and maybe even wring something positive out of this mess. What’s the difference between these paintings and cave art? At first glance, this may seem like a good point. Many of the protected instances of rock art and even graffiti in the parks aren’t necessarily that ancient – at Utah’s Newspaper Rock, some of the protected etchings are only about 60 years old. So who’s to say that Nocket’s work won’t be considered important in another 60 years? There’s a very simple answer to that question, though: Cave art and earlier graffiti existed before the land was under federal ownership and the protection of the Park Service, which makes it very clear that any sort of vandalism or defacement is a big no-no. Beyond the cut-and-dry legal boundaries, it’s also been noted that in many cases those petroglyphs and pictographs were some of the only sources of artistic expression for that culture – or they denoted sacred or important landmarks or were even just a way to decorate a home. Today, artists not only have an almost limitless number of venues for self -expression, but they also have a wide variety of ways to publish their work. There is no need to deface public property for your art – and there is certainly no need to crawl over pictographs for a “cool” Instagram shot as she apparently did near Barker Dam. Even though most of those pictographs were painted over in the 50s, there are still some originals in that cave – and defacing them can land a person in federal prison. One person’s graffiti is another person’s street art. This is a matter of subjective taste. I live in Los Angeles, which is not exactly known for being one of the world’s most photogenic cities. However, we have a wonderful culture of murals and street art and I actually find many examples to be vast improvements over our otherwise drab building exteriors. Again, the difference here is that most (but admittedly not all) buildings with murals and extensive street art give permission to artists to create their work on privately held property. Regardless of whether or not you consider the Creepytings paintings to be art, they were most definitely not done with permission and done on land that literally belongs to every American. Well this is what happens when you get city people coming to the National Parks. To be honest, this response bothers me a lot. Whether you live in a town right outside a National Park, a sleepy surburb, an overpriced skyscraper condo, or a neglected inner-city borough, these National Parks are yours and you deserve the right to visit them. This issue has nothing to do with city-types in the backcountry (it seems like Nocket lives somewhere in upstate New York, and not New York City anyway) or East Coasters trashing our West Coast parks, or about the gender of the person responsible – it’s about graffiti in National Parks and that’s it. It’s just one person leaving a few paintings around outside. Aren’t there more important things to worry about? People seem like they’re out for blood! Yes, they do. This is difficult to explain to people who don’t enjoy the being outside like we do, but I’ll try. When you experience the great outdoors you are surrounded by an incredible sense of awe and wonder. Unlike most activities and products today that put ME ME ME at the center of the universe, gazing upon Yosemite Valley for the first time or looking out at the vast expanse of the Grand Canyon is a way of letting the Universe put you in your place. You are instantly humbled and you will remember the experience forever. It’s been years, but I still get goosebumps thinking about the first time I saw the waters of Crater Lake or the first time I got out of my car and was floored by Death Valley’s unbelievable silence. These are experiences that remove us from our push notification addled, social media soaked modern life and remind us that we are but one tiny, temporary sliver of the world. That is the true work of art here – so when that work is marred, those of us who’ve had that experience outdoors feel like we’ve been punched in the gut. You wouldn’t add a doodle to the Mona Lisa, would you? (Puckish French artists excluded). We also know what our rangers and park staff are up against. Parks are just not on the priority list for any government, be it state, local, or federal. National Parks and Forests suffer from perennial under-funding and most of the money they do receive goes to things like fire suppression and not trail maintenance or patrolling rangers. Here in Los Angeles, our Angeles National Forest receives almost as many visitors a year as Yosemite but gets only a sliver of the budget, and as a result trails are falling apart, visitor centers are unmaintained, and on some of the more popular trails, graffiti and pollution are rampant (although we’re hoping its new designation as a National Monument will help with that). Yes, Ms. Nocket is one person – but what happens when dozens more like her follow and there’s no money in the budget to clean up after them? Saguaro National Park has had to deal with a rash of social media-inspired graffiti on its namesake cacti and Joshua Tree’s historic Barker Dam is currently undergoing renovation after dozens of people scratched their names into its historic surface. Graffiti on the East Fork Trail. Photo by Colleen Greene. From the photos on Instagram, it seemed like most – if not all – of the paintings were in highly visible areas not too far on the trail. The Kayenta Trail to Emerald Pools is one of the most popular in all of Zion National Park. There are almost always crowds at the Barker Dam site in Joshua Tree. The Mist Trail is only a few minutes away from the throngs in Yosemite Valley. Canyonlands’ Roadside Ruin is literally in view of the only paved road in the Needles Section of the Park. Not only was this graffiti left right where a majority of park visitors would have to see it – but they were also left on routes that – if budgets allowed – would probably have patrolling rangers. This combination of a love of the outdoors and a frustration with the severe contrast of care our public funds provide is, I think, at the core of a lot of the rage that’s been vented in comment forms all over the Internet. But the reason people are pushing for maximum punishment here comes both out of the sheer scope of her crime (again, perhaps ten or more National Parks may have been defaced by her) but also from recent history. Last year, two Boy Scout leaders toppled some 170 million year old hoodoos in Utah’s Goblin Valley State Park (and like Ms. Nocket, they also put their crime on social media). They faced five years in prison but instead were each fined less than $2000 and stripped of their Boy Scout titles. We don’t want to see that happen again. So what, do you want to ruin this girl’s life? No, we don’t. We just want her to be held accountable. I’ll speak for myself here: if she’s found guilty, I would like her to be punished to a reasonable extent of the law – and potentially banned from National Parks for a time. She needs to be fined and do some community service in parks and she definitely needs to realize the consequences of her actions. But more importantly, I hope that everyone who’s as outraged about this as I am can take that rage and turn it into something positive. Instead of fuming in comment threads and signing petitions, find a local park you care about and volunteer some time to help clean up or maintain trails. Donate to a conservancy. Write to your Congressperson and ask them why our parks don’t get the money they need. Or better yet, find someone who doesn’t understand what the big deal is about this and take them outside, show them what a little time in the wilderness can do, and let them find out for themselves. “Do you want to ruin this girl’s life?” My answer is whatever she gets, she did it to herself. She had been warned, and she didn’t respect that, which means she doesn’t respect her own life. Graffiti is a violation on property. Put simply, if you don’t own something, you don’t get to deface it. It’s the equivalent to environmental pollution in a lesser degree, but still pollution. This is federal land owned by the people of the United States, and by her actions she pissed on an emblem of the nation’s will. It’s owned by all of us and we all decide how to treat that land, not one person. It may seem exaggerated, but it’s just that. What should we do with those who have no respect for the nation? Just say “don’t do it again”? Whatever she’s getting is just a slap on the wrist from a judge showing restraint. But my greatest hope is for her to learn the lesson. afterward he must be pay a quick visit this web page and be up to date daily. Casey Schreiner Dec 17, 2014 10:12In reply to: Jeff H.
You are not the only one who's wondering what's taking so long. This morning I sent an email inquiry to the Chief Public Affairs Officer of the Park Service. I'll update information as soon as I get it. Hi Casey, I’m wondering what ever happened with the “other Casey (Nocket)”? After scouring the net looking for updates, it appears the whole issue has just been swept under the rug and forgotten. I’m sure I’m not the only one hoping this idiot is prosecuted to the fullest. Do you know what’s happened? "......find someone who doesn’t understand what the big deal is about this and take them outside, show them what a little time in the wilderness can do, and let them find out for themselves. "...Casey Schreiner. One last comment (I hope) for all hikers who are concerned about this issue. It will come back into the news once the courts are done with her. No telling what the outcome will be, but the graffiti "artists" might also troll back here trying sneak their philosophy back into the discussion. This is not something to ignore. Don't be afraid to stand up and challenge them. Some of them sound intelligent, but they're basically cowards with no respect for others. When they make these statements that are simply intolerable, challenge them head on. Never mind the rest of their con, don't fall for it. There is no grey area about how to paint our National Parks in an environmentally friendly way. Its crazy talk and stand up to it. Don't be a silent lamb, its deafening to those of us who see what they're really up to. This issue become more about the threatened violence really intended or not. Also ridiculousness of profanity spewed in absolutely the most childish way possible. And jail time on the taxpayers dime ---- that being a total waste of money in every conceivable way. It has turned into a witch hunt far overshadowing the so called and uncalled for "artwork" if you want to call it that. You took a 1200 word comment detailing personal confessions, ambiguities in presentation, and condemnation of the Creepytings vandal and reduced it to a single sentence that fit your preconceived outrage. "Excellent comment" could have been in reference to this person's admissions, or their experience, or even their ability to participate in an online discussion without completely flying off the handle. It is incredibly facetious of you to imply that by saying something is well done that I agree with every single one of the points made by that piece, in the same way I can say that I like "The Silence of the Lambs" but not be pro-cannibal-serial-killer. This is bumper sticker political discussion at its worst and I absolutely will not have it here. I am under no obligation to you to police every single comment on this site. I wrote my peace in the original post and - if you pay attention to it - you'll find it to be a very clear condemnation of Creepytings' actions. In every single interview and statement I have given, I have addressed the chalk comments and specified that if she did use chalk it would still be vandalism and illegal. I do not have the time nor the desire to respond to people who don't read what came before their comment - and at this point, honestly, I regret even trying to clear up some of the gross misconceptions here. If you want to express your distaste for others' comments and positions then you are welcome to do so in a polite manner. If you continue to use faulty logic and incendiary language, don't be surprised when people react to you in a negative way and don't be surprised if you find your comments deleted. I hope my conclusion is incorrect. You seem like a really nice guy, but those are exact quotes and the rest of the context is below. People will find several comments about the use of acrylic paint instead of another medium with little or no pushback. And the art has to better, let's not forget that popular discussion here. Lose the snake people, how about unicorns and rainbows on the face of Half Dome in water-based paint with chalk borders. Should be just fine, no argument here. You have yet another chance to straighten this out. if you can't say no to them, then you're just providing these people a platform to convince themselves its okay. Sorry, but you can't claim to be "unwitting" about it. Step up, please. Mark, your ability to jump to incorrect conclusions seems to far outdistance your reading comprehension.